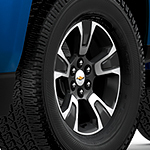 You owe it to yourself to explore the technology features of the Chevrolet Colorado. We are here to show you just how much convenience and safety you can enjoy out on the roads. An available built-in 4G LTE Wi-Fi hotspot will make it easier for you to stay connected. This way, you can play music from a variety of different apps. Plus, you can connect your smartphone in order to have even more connectivity. Hands-free calls, navigation, and more are available within the pickup truck. The Chevrolet infotainment system can also provide you with multiple USB ports, wireless charging, and a number of connectivity features. Plus, when it comes to safety and technology, you can enjoy a standard rear vision camera, forward collision alerts, and Lane departure warnings. This can ensure sensors will tell you more about what’s going on in traffic.